October 1, 2012 by LindaJoy Rose . 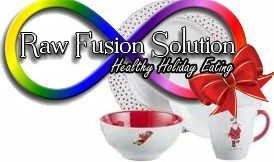 Posted in " Raw Fusion Solution, Recipes, Snacks, Sweets " . 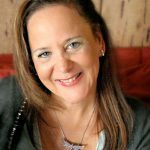 Tags " cashews, chocolate, Chocolate Chip Cookies, germinating grains, gluten free chocolate chip cookies, healthy dessert recipes, oat flower, soaking and sprouting, steel cut oat groats " . This time I decided to adapt the recipe to a “raw fusion” style by using pre-made chocolate chips.I bought a high cacao version, which sure made these a lot easier! You can buy vegan chocolate chips, made without dairy, and even carob chips. Making oat and cashew flour does require some extra steps but well worth the effort. I made plenty and refrigerated the rest so that I have enough to make another batch when these are gone. Note: What you will buy are STEEL cut oats (or oat grouts) not the rolled or quick oats that we see more often. They are sold both packaged in and bulk bins at most health food stores. These cookies are more the chunky, soft, chewy variety and absolutely addictive! You can make them in a dehydrator for totally raw or in the oven. *Oat groats flour = Put steel cut oats (you can usually buy these in bulk bins) in a food processor or high powered blender and process until it becomes a fine flour – approximately 3-5 minutes. **Cashew flour = Place dry raw cashews in in a food processor or high powered blender and process until it becomes a fine flour – approximately 3-5 minutes. Directions: Place oat flour and cashew flour in a large mixing bowl. Add water, vanilla, salt and sweetener and blend well, stirring in chocolate (or carob) chips. 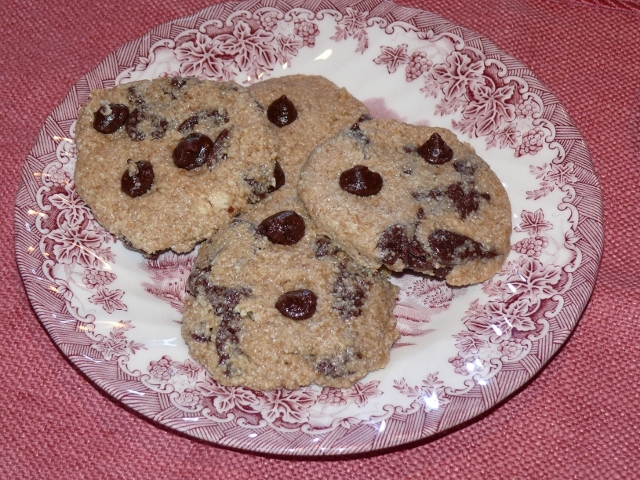 Shape into cookies and place on parchment paper covered dehydrator tray OR cookie sheet. DEHYDRATOR: Dehydrate for 4 hours at 115 degrees. If they are dry enough, remove from parchment and place on screens to continue drying. They will never be totally dry but rather moist and gooey – and totally delectable! OVEN: Make sure to line cookie sheet with parchment paper – Keep temperature very low (you can even prop open the oven door with a folded oven mitt. The idea is to get them drier but not overcook. Check after 1 hour and go from there to determine how long (I have not made them in an oven yet) Plan on 3 hours. 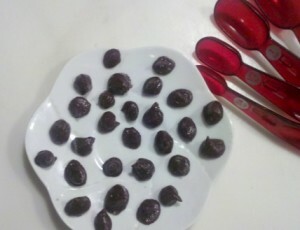 This photo above is of the homemade raw chocolate chips I made the first time around. 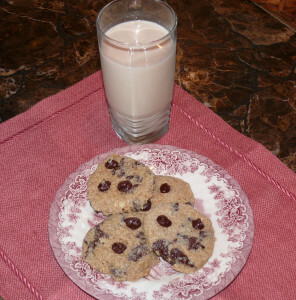 Cookies and Milk go together so well! That’s a homemade almond-brazil nut blend. 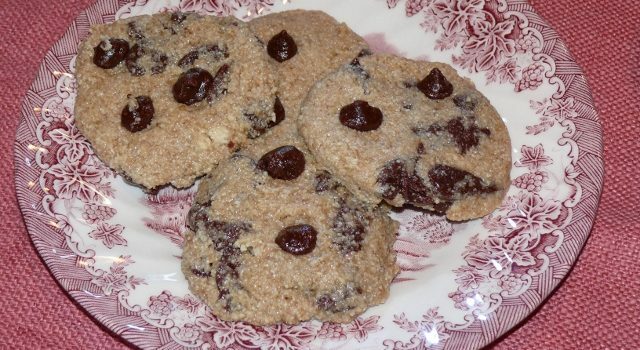 I did add one step to this batch of cookies to supercharge the nutrition, but it’s not something that you absolutely need to do. I soaked the oat groats overnight – then germinated them for about a day. This simply involves letting the soaked groats drain on a wet paper towel placed inside a colander and covered with another wet paper towel. Any time you sprout or germinate seeds, nuts and grains you enhance the living essence. After one day of germinating, I dehydrated the groats until completely dry before turning it into oat flour. If you enjoy daily recipes for body, mind and spirit, come and play at our Facebook page!